Beautifully constructed boys oxford Christening shoe made of 100% polyester matte satin. 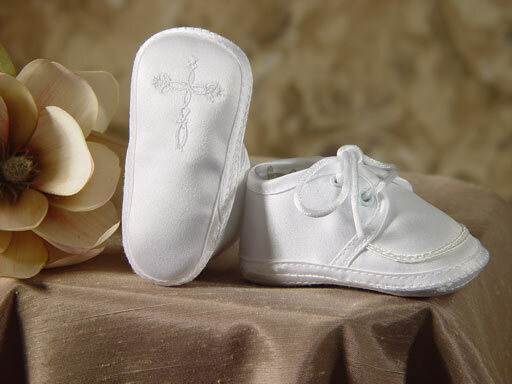 Whether or not your ancestry includes a "touch of the Irish", the Celtic Cross embroidery on the sole of this shoe, makes it the perfect accessory for any white Christening Set. This shoe is made of the same fabric as our matte satin boy's sets. A tiny braid accents the toe. When you want the perfect touch to finish your matte satin boys Christening set this shoe can't be beat.